NASA astronaut Steve Swanson took this amazing view of the northern lights from the International Space Station in July 2014. Call him the Instagram astronaut. NASA astronaut Steve Swanson, who returned to Earth late Wednesday (Sept. 10), wasn't all work and no play while he commanded the International Space Station. The American spaceflyer was also NASA's first astronaut to post incredible views of Earth from space, as well as daily life in orbit, on Instagram as part of the U.S. agency's social media space odyssey. 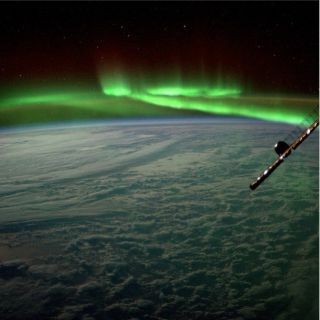 "One can't help but be awed by the auroras," Swanson said in a caption to the aurora picture that he posted in July. Clouds cast shadows on the surface of the Earth in a photo taken from the International Space Station. Another photo of Earth from the windows of the space station shows a gorgeous view of clouds casting shadows on the planet's surface with a hint of black sky in the background. The sun makes the planet shine with a golden glow. Swanson also took a stunning photo of a sunrise from orbit. Earth's blue atmosphere shimmers, with the sun appearing as a bright yellow star beyond the space station in the foreground. An orbital sunrise from the International Space Station. Not all of Swanson's photos show the glory of Earth from space. He has also given space fans on the ground a pretty good sense of what life is like on the space station. In April, Swanson had to venture out of the space station on a spacewalk to replace a broken computer on the outside of the space laboratory. During that walk in space, Swanson found some time to take a photo of himself. The Earth looms in the background, and the astronaut's American flag patch is visible in the image. "Nice day for a little stroll," Swanson wrote in an Instagram caption. NASA astronaut Steve Swanson takes a photo of himself during a spacewalk outside of the International Space Station. The NASA astronaut also posted a photo of the lettuce he has been growing for an experiment called Veggie (short for Vegetable Production System) on the space station. The goal of the mini-greenhouse research is to learn more about how to grow plants in space environments so that astronauts on long-duration missions to places like Mars can grow fresh produce. "Veggie is a newly installed plant growth unit capable of producing salad-type crops to provide the crew with a palatable, nutritious and safe source of fresh food and a tool to support relaxation and recreation," NASA officials wrote on Instagram. "The Veggie provides lighting and nutrient delivery, but utilizes the cabin environment for temperature control and as a source of carbon dioxide to promote growth." The Veggie experiment is used to grow lettuce on the International Space Station. Swanson is at the end of his space station mission. He and Russian cosmonauts Alexander Skvortskov and Oleg Artemyev returned to Earth Wednesday aboard a Russian Soyuz capsule. The three men launched to the space station in March, with Swanson posting the first Instagram photo from space a short time later in April. NASA's own Instagram photo feed (http://instagram.com/nasa) went live in September 2013. But if you were worried that the International Space Station Instagram account ends with Swanson, think again. NASA officials have said the photo stream is for the space station crew, and not any one particular astronaut. To follow the International Space Station on Instagram, visit: http://instagram.com/isshttp://instagram.com/iss.